Every home cook has her Achilles heel, the one dish or technique that she simply cannot master. For me, it’s homemade pie crust. Or as it’s referred to in my kitchen: stinking $#• &%@ pie crust! To say I’m dough-phobic is something of an understatement; the mere thought of trying to combine flour, shortening and water into something that’s supposed to melt in your mouth is enough to make me cry. Just ask my husband, who’s counseled me through many a pie-related meltdown. This is apple season, though, when my kids start whining for pie. Which is how I ended up in an apple pie crust demonstration at Gaynor’s School of Cooking in the South Side after work this past Monday. 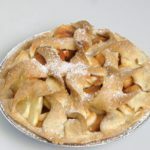 “You know, you do kind of have a thing about crust,” my editor reminded me, when he suggested — ever so nicely — that I take the workshop, co-sponsored by Slow Food Pittsburgh and the upcoming fifth Urban Applefest and Apple Pie Baking Contest Oct. 23 at the Union Project in Highland Park. Hmmm. Guess he was tired of hearing me complain, too. Here’s the problem with my pie crust dough. It’s either too dry, which causes it to crack in the pan and stick instead of flake in the mouth when baked, or it’s too wet, which makes it impossible to peel off the rolling pin. So then I add more flour, which makes it too dry, which makes it tough instead of soft and elastic, and well, you get the picture. Of me cursing. “I think you either get the crust gene or you don’t,” noted an equally clueless woman sitting next to me at the demo, with a wistful sigh. More likely is that some other family member (in my case, my mom) always supplies the holiday pies so you never have to make one yourself and master what my accomplished baker of a boss assures me is a very easy process. Adding to the confusion is that everyone has his or her own recipe for dough. 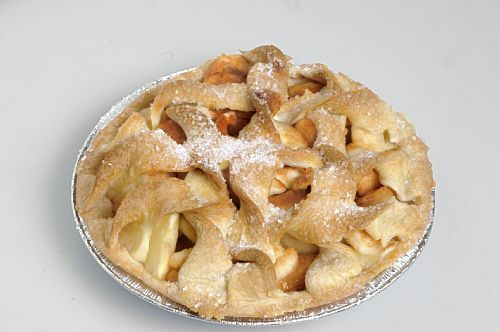 Applefest organizer Don Gibbon likes a mixture of oil, milk and flour, while PG food contributor Marlene Parrish, one of the workshop’s two instructors, prefers an old-fashioned crust made from flour, Crisco and water and blended by hand. I’m guessing Barrie Mars of Slow Food Pittsburgh might disagree. After Marlene left the stage, Barrie demonstrated a pie crust made in a Cuisinart with chunks of chilled butter and kneaded together using the French fraisage technique. See what I mean? As many recipes as there are chefs. After serving as Marlene’s guinea pig, and then watching Barrie work her magic on the cooking school’s butcher block counter, though, I realized it really isn’t as difficult as I’d always thought. Turns out, one of the biggest mistakes I was making was not letting my dough rest in the fridge for at least an hour before rolling it. I also didn’t know I had to fluff my flour with a fork before spooning it into a measuring cup (it compresses in the bag) and that instead of wildly rolling across the entire surface of the dough, I should start at the center and gently roll out to the edge, rotating the crust like a clock’s hand. Also, always start with a disc of dough instead of a ball, and don’t be afraid to gently reshape it as you go along with the edge of your hand. Perhaps most importantly, don’t be too hard on yourself. Being pie, it’s all good. • Lard makes for a great pie crust, but it’s a little “fussy” to work with. So it’s probably not for beginners. • Don’t have a pastry blender? You can cut butter or shortening into flour with a pair of knives. • Moisten your flour mixture with ice water; shortening turns oily when it gets warm. And add it slowly, because the temperature of your kitchen and ingredients can affect moisture levels. • If you roll crust between two pieces of wax paper, it won’t stick to the pin. You’ll also have an easier time plopping it to the pan. • Rolling right on the countertop? Fold the crust into quarters before transferring. • The crust should be 1/2 to 1 inch larger than the pan; turn the pan over on top of it to measure. • A little bit of water brushed on the edges will glue the top and bottom crusts together. A dusting of raw sugar on top (first brush the crust with cream or milk) will make it sparkle. Remember to add water slowly and make sure it’s ice cold or you could end up with a crust that sticks to the rolling pin. Measure flour and salt into a medium bowl. Cut in shortening with a pastry blender or 2 knives until it looks like coarse meal. Sprinkle water, a tablespoon at a time, on the flour-shortening mixture. Mix and toss gently with the tines of a fork. Use only enough water to make the dough stick together and “clean” the sides of the bowl. Give the dough a small squeeze and if it holds together, add no more water. Tear off 2 sheets of wax paper. Divide the dough into 2 piles, 1 on each sheet of paper with 1 pile slightly larger than the other. The dough will be a little crumbly, but not dry. Cover each pile of dough with a second sheet of wax paper. Lightly press into a disc shape using the sides of your hands. Allow the dough to “rest” in the fridge for at least 20 minutes. Resting is important. The dough can also be frozen at this stage. Remove the dough from the fridge, and allow to stand at room temperature for about 10 minutes. Starting in the center of the dough and rolling to the edge, roll dough part-way out. The sides will look cracked and uneven. To correct this, lift the edge of the top paper and, using the “pinky-edge” side of your hand, push edges of dough back in towards the center to make a neat round edge. Replace the paper and continue rolling until the circle of dough is 1 inch larger than the inverted pie plate. If dough edge gets cracked again, repeat the pushing of the dough with the side of your hand. Gently peel off the top sheet of wax paper and discard. Using the under sheet to help pick up pastry (it will adhere and not slip), invert the dough over the pie plate, paper side up. Center the pastry. Ease pastry down into pie plate, pressing lightly on the sides and bottom. Do not stretch. Trim pastry edge evenly with scissors leaving a 1-inch overhang. For the top crust: Roll out the remaining dough between 2 sheets of wax paper to a circle about 1 inch larger than the inverted pie plate. It will be slightly thinner than the bottom crust. Peel off the top sheet of wax paper and discard. Place the filling that you are using in the pie shell. Moisten the pie shell edge with water using your finger or a soft brush. Using the bottom sheet of wax paper as support, invert and center pastry over pie. Peel off top sheet of paper. Make several gashes in the center of the pastry with a knife to allow steam to escape while baking. The crust should extend about 1/2 inch all around the pie plate. Tuck overhanging crust under the bottom crust and flute the edge. If you like, brush the top pastry with milk or cream and sprinkle it with sugar to add sparkle and crunch. Bake as your recipe directs.